My last few posts have been pretty much dedicated to dishes served over the Holidays. Today’s recipe, Porchetta con Finnocchio, is yet another of those dishes and was served not just around Christmas but whenever there was reason to celebrate. 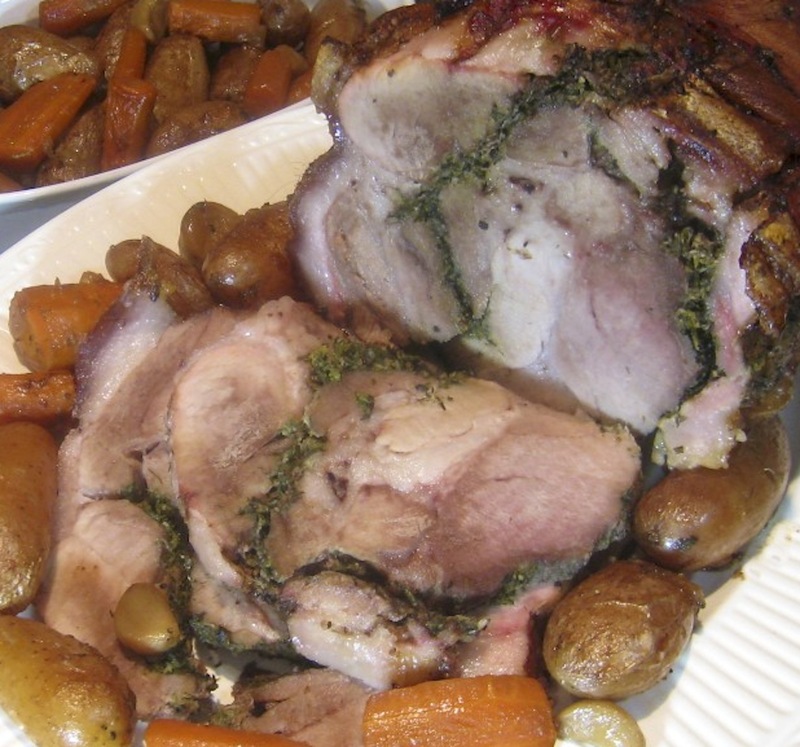 Similar in preparation to most pork roasts, this roast differs because of the cut of meat used and for the use of fennel, finnocchio, as seasoning. Traditionally, porchetta meant the roasting of an entire pig. In fact, one such pig was roasted at a neighborhood bakery and served at the wedding reception of Zia & Uncle. (Imagine a time when “A”, there were neighborhood bakeries and, “B”, you could use their oven to roast a pig!) Now, that may be fine when feeding large groups but, for most families, a pig roast is out of the question. My family, like many, used the pig’s foreleg, the picnic ham, for the roast. The meat was butterflied, removing the bone in the process, and then heavily seasoned with, among other things, fennel fronds which are similar to dill in both appearance and taste. The result was a juicy roast, with herbal flavoring throughout. Times have changed and picnic hams aren’t as readily available as they once were. My family switched to roasting bone-in pork loins initially but, as time passed, they, too, became less available and we began roasting boneless pork loins. Although still very good, the loin is a lean cut of meat and some will forever favor a porchetta made using picnic ham over one made with pork loin. In a future post, I’ll share a recipe for porchetta using a pork loin but, for today, we’re once again turning back the clock to roast a leg of pork. This recipe differs from that used by my family in a couple of ways. First off, I wanted to make sure that I had a sauce to serve with my porchetta. To that end, I include roasting vegetables in the pan, adding stock & wine as a basting liquid. I, also, love roasted vegetables and add potatoes and carrots to the roasting pan about an hour after the roasting has begun. In contrast, the most my family put in the roasting pan was a few potatoes, and even that was a rarity. As a result, I don’t remember Mom ever serving a sauce with her porchetta. Lastly, and this is a big one, relatively speaking, I include sliced finnocchio as a roasting vegetable. This would never have been done back home, for fennel was always served raw, the fronds and smaller stems being frozen for later use in a porchetta. 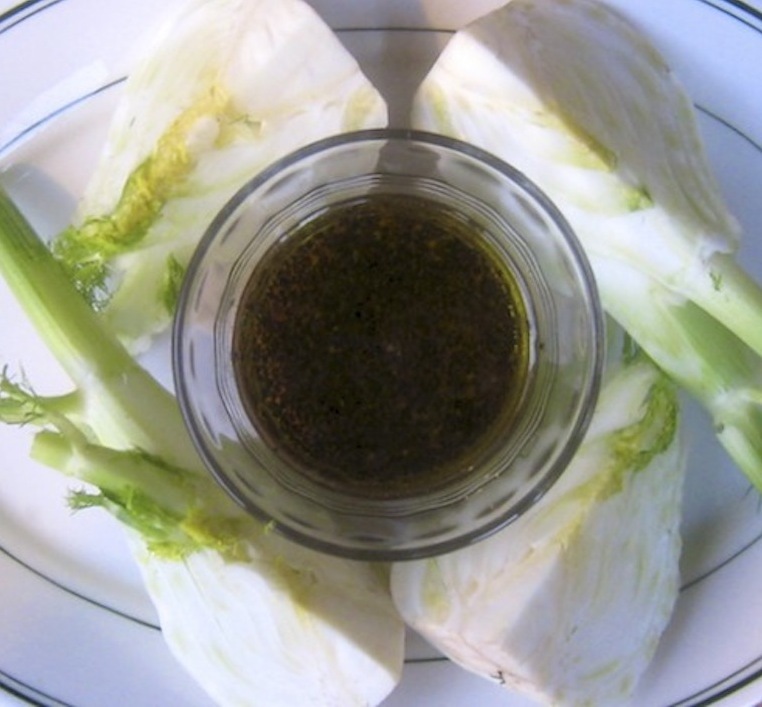 Whether served alone or among crudités, fennel was either served plain or with a small, ramekin-sized dish containing a simple dipping sauce of extra virgin olive oil, salt, pepper, and maybe a little red wine vinegar. (There is a name for this sauce but neither Zia nor I can remember it.) I broke with tradition when, about 15 years ago while they were visiting Chicago, I served Mom & Zia a whole sea bass that had been stuffed with, and roasted upon a bed of, fennel. That was the first time either had been served cooked fennel. So, for me to add fennel to the roasting pan is somewhat of a big deal. The flavor it brings to the sauce, however, is well worth the change. Still, should you wish to roast your porchetta in true Bartolini fashion, prepare the roast as indicated below, omitting all the roasting vegetables, and place the porchetta on a roasting rack centered in a roasting pan. No matter how you roast your porchetta, bear in mind you may need to adjust the amount of herbs needed depending upon the size of your roast. About an hour before the porchetta is to go into the oven, combine the fennel fronds, parsley, chopped garlic, and rosemary. Add enough olive oil to make a paste, stir, and set aside. Use a sharp knife to score the pork skin, making a checkerboard or diamond pattern. Try to avoid cutting deeply into the pork meat, if at all. Place the roast, skin-side down, and “open it,” revealing as much surface area inside the roast as possible. Evenly coat the exposed flesh with the herbal paste created in Step 1. Season with marjoram before liberally seasoning with salt & pepper. 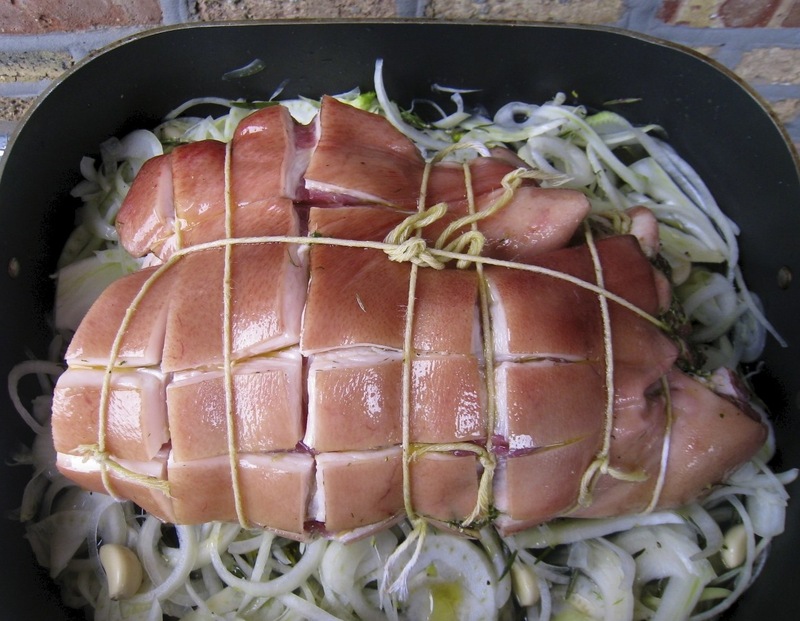 Use twine to tie the roast securely. Set roast aside while it loses its chill. In a roasting pan, add the sliced onions, fennel, celery, and whole garlic cloves. Season liberally with salt & pepper. Place the roast atop the bed of roasting vegetables. Pre-heat oven to 450˚. Coat the roast with olive oil, add 2 cups stock plus 1 cup wine to the roasting pan. Meanwhile, place potatoes and carrots into a large bowl, season with salt and pepper, some rosemary, and enough olive oil to coat. Mix well. After 60 minutes total time, reduce oven temperature to 325˚, baste the roast adding more liquid to the pan if needed, and place the seasoned carrots and potatoes into the roasting pan. From this point forward, continue to baste the roast every 30 minutes or so, replenishing the pan juices when necessary. 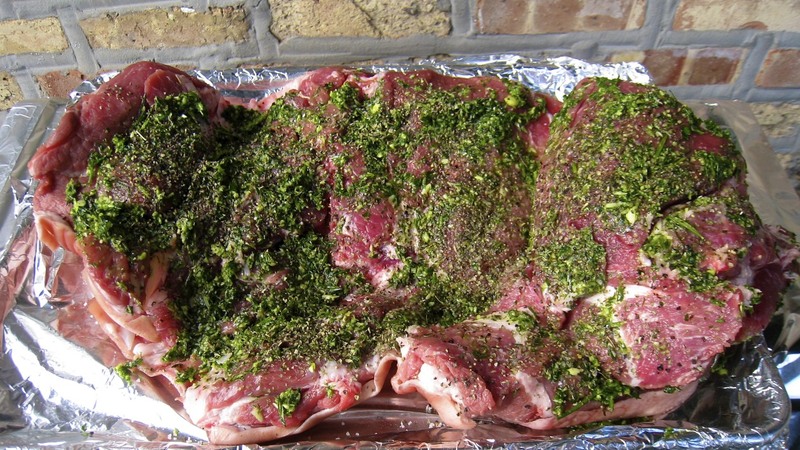 If outer skin grows too brown, use aluminum foil to tent the porchetta. Roast will be finished when the internal temperature reaches 165˚. When ready, remove roast to a cutting board and tent with aluminum foil to rest for at least 15 minutes. Remove the carrots and potatoes to a covered bowl. Strain the pan juices from remaining stewing vegetables. Use the reserved 1/2 cup of wine to deglaze the roasting pan over high heat. Use a grease separator to remove all but 3 tbsp of grease from the strained liquid. Reduce heat to medium, add the 3 tbsp of grease to the roasting pan, and add 3 tbsp AP flour. Mix thoroughly and cook for a minute or so to create a roux. Add the remaining pan juice liquids and stir until the sauce begins to thicken. Begin adding the reserved of stock to the pan, stirring constantly, over medium heat. Once all the stock has been added and the sauce thickened, taste for seasoning, remove from heat, and add a tab of butter to finish the sauce. Before carving the roast, use a small knife to remove the skin (crackling), which may be served with the roast or left in the kitchen as the Cook’s reward. Slice and serve the roast, accompanied by the sauce and reserved roasted vegetables. You’ll note the recipe calls for fennel fronds when, in reality, Mom also used the small, thin stems along with the fronds. I believe these stems bring much flavor to the roast but no one wants to find a stem in their food. To get around this, I make sure any stems used are chopped as finely as possible. This entry was posted in Family Recipes, Main Course (Secondi) and tagged Cooking, family recipes, Fennel, Food, Italian, Pork, Recipes by ChgoJohn. Bookmark the permalink. Well, if not a fennel fan, try using dill. Though not the same, the 2 herbs are very similar. Even without both, you’ll love it just seasoned with garlic, rosemary, parsley, and marjoram. My oh my – haven´t had this for years. It looks amazing and I too would probably do the roasted vegetables and sauce with it. And I´d also be in the kitchen hustling you for some crackling! Another fabulous recipe with a great story to go with it. Will have to ask my dad what the dipping sauce was called in his house as I can´t think of the name either! All I can say is that I’m dieing for a piece of that meat! I can just imagine how tender and flavorful it must be. Picnic hams are readily available where I live as the Cubans and Puerto Ricans always use this for the pork roast. The raw fennel brought back many memories, it was always served after the big meals. I can’t quite get anyone today interested in eating it that way except for my cousins that grew up on it like I did. I like your addition of the sauce, little tweaks along the way work fine for me! This would have been served on New Years Day in my family. Again, beautifully written post! Thanks, Linda. I can find picnic hams at my ethnic grocers’, too, but they are extremely rare at the “normal” supermarkets. We, too, had raw fennel fairly often in the colder months and I never think to buy it now. I really do enjoy it when I do, however, so maybe it’s a good thing I don’t buy it weekly — I’d grow tired of it. And, yes, porchetta would have graced one of the 2-flat’s New Year’s Day dinner tables. 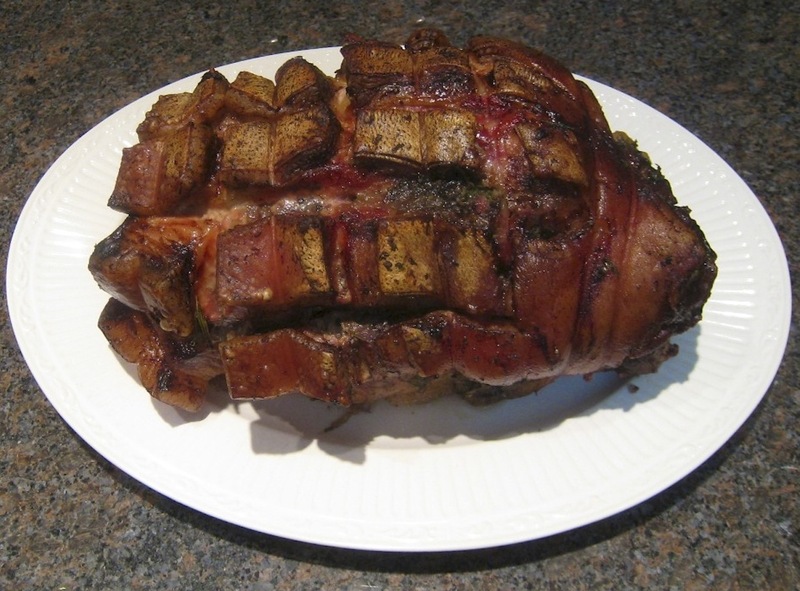 In fact, we were much more likely to have porchetta for a holiday than we were to have a ham. As much as I love a good ham, I’ll choose porchetta every time. Thew reason that i am growing my own pork this summer is so that i can cook a roast like this. Down here I cannot find pork with the skin ON! Who is your butcher?. I am a fennel fiend, i just love it so the balance of tastes in here work very well for me. Plus i am with you on roasted veg..! I am very fortunate to have a butcher just 2 blocks away. Although I can get smaller picnic hams at my ethnic grocers, I ordered this larger one from my butcher and he de-boned and butterflied it for me. This was so much easier than doing it for myself. And, yes, I love how this herb mixture flavors the pork. This Summer, I’m going to try this again but cook it on the grill. I love how a pork roast tastes when it’s grilled! Well, first off: Welcome home, Sharyn! I hope you had a great time. My brother is very much like your Mom. He always hated any traces of fat in his meat. This roast tastes great because of its fat content so your Mom may not be thrilled with it. I plan to revisit this recipe but using a pork loin instead. Maybe we can come up with something your Mom would enjoy. Fingers crossed! Thanks, John. Camp was fun and I have now caught up on my sleep. Now I am catching up with all the end of the year/beginning of the year tasks, the first being mucking out my room and throwing useless things out. Mom used to eat roast pork when she lived in the Midwest: she had to stop eating it because its richness made her feel ill — that’s why we eat pork loin instead. I have an eye on your combination of seasonings because your roast sounds scrumptious. Porchetta is such a fantastic dish, and your recipe is superb. Total winner. Thanks, Roger. This dish is a favorite of mine and it hardly seems like the holidays without porchetta gracing the dinner table at least once. Thanks, Christina. This is one of those recipes from “back in the day’ that just doesn’t get made as often as it should. Preparing this post was a real treat for that very reason. I love fennel, John and roasting it just brings out the sweetness. What a great pairing with the pork shoulder. The skin must have been very crispy and tasty too! I really like the idea of au juice with the meat. I agree with Kristy, it is indeed a very celebratory roast. I’m wondering how much a piece of pork like that costs? Ham is usually very expensive, but this meat is neither smoked nor cooked when you buy it, is it expensive? Thanks, Eva. This roast was purchased, de-boned, and butterflied at my butcher and I served it on New Year’s Day. At a little over $3.00 per pound, it was expensive and certainly cost more, per pound, than the smaller roasts that I see at my ethnic grocers. Those, though, being smaller, are just partial hams and, therefore, roasting and carving them is a bit on the tricky side. I cannot recall their cost but will check for you during my next shopping trip. Raw fennel, huh? I will have to try that. I really want to try this too. I love roasted fennel and this is a perfect special occasion or company meal. You surprise me, Greg. Fennel is so widely used in Sicily that, with your family’s heritage, I assumed you would definitely have tried raw fennel at some point. I’m sure you’ll like it as-is or chopped and added to a salad. Sorry to interject: One of my flavourite Italian restaurants, Bar Mercurio, serves an amazing grilled calamari with shaved fennel with mango salad! Just thinking of it makes my mouth water! I really love the anise flavour of it! Feel free to interject anytime, Eva, especially if it is to mention a dish as good as this grilled calamari! What a great combination of flavors! I may just have to print this out and use it for our Easter meal. What a gorgeous piece of meat! I love how the herbs are marbled throughout it when it’s sliced. Beautiful!! Good, I’m so happy they liked it! Just printed out your recipe. When you say “ethnic” grocer are you referring to an Italian market/butcher? I just read Cecelia’s comment about not being able to find pork with the skin on where she lives. How awful! And then I read another comment about someone not liking the skin and fat…I gasped. Ha! My mother in law made a wonderful ham on New Year’s day and I made sure that I picked the pieces that still had crispy skin and fat. YUM! Exactly, Caroline! This kind of roast is perfect for any of Winter’s holidays. It certainly was a big hit around our place. And a Happy New Year to you, too! Wow, this is a beautiful roast and such a proud thing to present to company!! And that fennel!! I can’t quite make it past that first photo.. I keep scrolling up to stare at it! And now I’m hungry… again! Ahhh you torture me… what would one put on such a sandwich??? So your sourdough starter worked after all:) Glad to hear it!! Well, yes and no, Smidge. Last year I bought 2 sourdough starters that are supposed to be Italian in origin. Rather than use all of the starter as indicated, I used half of one and froze the other half along with all of the other one. After killin off my starter, I decided to start both. One was used in a loaf for the porchetta and the other gets it’s “first run” tomorrow. Eventually, once they get more fully flavored, I’ll decide which is worth keeping. I’m a little timid of cooking with fennel, as very much of it brings out more of the anise flavor than I prefer–and most of the rest of my family won’t touch it at all for that reason–but your mention of dill, though quite a different flavor, makes me think I’d go *that* direction myself. I might throw some hunks of celery in with the roasting veg to give that slightly resinous and very aromatic quality that fennel imparts (the part I really *like* about fennel), plus imitating the texture of the stems without being too woody when roasted. But the technique and the combination as shown, overall: glorious! I wouldn’t hesitate to dig in! Thank you, Kathryn. I’ve used dill in place of the fennel and it works just fine, as would your idea of substituting more celery, I’m sure. To be honest, it is such a great cut of pork that it would be hard to mess it up. And everyone sure did “dig in” whenever it was served. For me, it just wasn’t served often enough! That is the most gorgeous looking piece of meat and such a lovely presentation for a holiday or any festive occasion…including just plain dinner! I love fennel raw, cooked and the fronds for their herbal addition. I know this dish just has to taste as good as it looks…I’m definitely adding fennel to my next veggie roast and want to try out this roasted pork recipe as well. Thank you! Thank you for the compliments. Porchetta as always been a family favorite, fennel and all, and it is as much a part of a family celebratory dinner as turkey is for Thanksgiving. If you love fennel as an herb, you’l love this roast! I use fennel when I make tuna salad. Allegedly, it helps dissapate some of the gas caused by the tuna. Thank you, my fellow fennel aficionada! My lunch today was a fennel bulb and that dipping sauce. Well, I started with a quarter bulb as a mid-morning snack but, by lunchtime, the entire bulb was gone, along with my appetite. All facts considered, it was a pretty good lunch. And I hope you share your risotto recipe. It sounds delicious, Claire! It would be such a treat to turn up to a dinner party and be served this. It looks so good I can almost taste it. I love the herbs you have used and I think roasted fennel would work very well with this dish. Love the colour of your crackle. After reading your blog, Linda’s and Greg’s, I am beginning to wish I grew up Italian! 🙂 Although my mom is a fabulous cook but I love the vignettes you create in your posts and I can imagine being at your family’s table. How lucky you were to grow up like this and this Porchetta looks AMAZING! I am now curious to try fresh Fennel. Take care and have a great week. Thank you, Geni. Hindsight being what it is, it wasn’t until I’d moved away and lived on my own for a while before I realized just how special those times were. I can’t wait for you to try some fresh fennel. I bet, with your culinary skills, you’ll be able to come up with some great uses for it. This is my first visit to your blog and you’ve won me over with 2 words – pork and fennel! We grow our own fennel in the garden (actually, one popped up purely by accident…) but we’ve never used the fronds so thanks very much for your recipe. Welcome to my blog! I envy your ability to grow your own fennel, made even worse being it’s growing “wild”!!! I hope you like it with pork and can’t wait to see if you come up with some uses of your own. Thanks for dropping by! I love, love, love fennel! And adding it to your pork roast is just grand! Your roast was beautiful both before and after baking! Next time I am having company this will be my recipe! Thanks, Phyllis, for your kind words. It’s been some time since I roasted a porchetta and decades since a fresh ham was used. I can tell you, though, it won’t be that long again. If you try it, I hope you find it as enjoyable. What a great recipe, John. I love fennel…both raw and cooked. I have grown it in my garden even though it is suggested that you don’t grow it near tomatoes which causes a problem for me. I also collect the seeds each fall for recipes. To me the flavor… raw, cooked or the seeds is wonderful. I have no problem buying what is called a “fresh ham” here in New Hampshire at all of our grocery stores. If I don’t need the whole leg, I can also buy the shank or but half. Your recipe reminds me of visits to Italy and buying a sandwich from one of the trucks where they sliced the meat from the entire (whole pie) porchetta. Great post! Thanks, Karen. I’ve no experience growing fennel, although I wish I had the room to do so. Isn’t Italian “street food” fantastic? It makes me laugh to see tourists lined up at McDonald’s when, 2 doors down, is a place selling panini, made with porchetta or prosciutto or buffalo mozzarella, for half the price. They don’t know what they’re missing! This sounds delicious, and I can just imagine how good it smells. I love fennel and enjoy it with pork. However, I haven’t tried your technique of using the chopped fronds to flavour the meat. I will definitely make this one day, although I confess I will probably use a loin roast! Pork with fennel! I’d not had tha combination, and with skin on pork roast! Be still my heart! I must try this! Funny how the comments have gone. Many have cooked with fennel but never tasted it raw. My family only used fennel with pork and only ate it raw. And, yes, David, you do need to try this, judging by the recipes you’ve posted on your blog. This roast, cracklin’ and all, is something you’ll love. Hello, Debra! This is a great spice combination and one that my family loves with pork. Adjust it to suit your family’s palate. You make porchetta for your SIL and he wil be yours forever! (That must be an Italian proverb somewhere.) Although this was a huge roast, you can get them smaller. Ask the butcher in your store’s meat department for help, or, go to a butcher, like I did. Oh boy! What an incredible looking roast! We have just bought half pig and I had the leg cut in half so that I can do two roasts. The only thing I would swap out here is the fennel – really not a fan but I do love dill, which I know is a bit odd, but then again, I am a bit odd. I think that you changed the family tradition and added the veggies is a grand idea. Delicious! Half a pig? Lucky you, Mandy! Although my family traditionally used fennel, I’ve used dill a number of times and enjoyed a tasty pork roast, as a result. Thanks for commenting, Mandy, and have a great day! Thanks. This dish is perfect for a cold Winter’s day for just the reason you’ve mentioned: the fragrance. Between the garlic, herbs, and pork, it really is a sensory assault, in the best possible way. Seriously though, great job and recipe. Thanks, Jed, and I agree about the smoke. Now that I’ve got the old recipe written down and posted, I’m free to check out alternatives. If I ever post a porchetta “smoker” recipe, I’ve a cousin who’ll go nuts! He’s all about the smoke. This looks wonderful and must taste delicious! We often use dried fennel seeds to roast pork with if fresh fennel isn’t available, but fresh is better. And the idea of a whole pig cooked like this….and a neighbourhood oven. The neighbourhood oven in our village was just next door to our house – would have been convenient if it was still there! We eat fennel raw, but I’ve been wanting to try it roasted by itself with some olive oil and Parmesian cheese or add it with my chicken in the oven. My dad loves porchetta! When my Zio roasts a pig, it’s a huge Italian party at his house, doesn’t matter what time of year or day it is. Thanks for the tutorial on how to roast pork, now I can tell my Zio I know how to cook pork so when he comes over for dinner he can enjoy traditional Italian pork dinner. I am not at all well-versed with roasting fennel, our family only ate it raw or used the fonds as herbal seasoning. Your suggestions sound wonderful, though. Well, mention parmesan cheese and you’re sure to get my attention. I wonder what other recipes your Zio has at his disposal. I hope you get the chance to find out. I’m sure you would love this dish. The herbs really do impart a great flavor to the roast. Beautiful. I love the use of picnic ham as opposed to pork loin because it gives you the nice skin. John, I love your recipes and family stories so why wouldn’t I find this recipe once you told me you made it? Kudos to you for a great blog. You are very kind, Sir, thank you. Thank you, Judy, for being so generous with your compliments. My family has used fennel, garlic, and rosemary with pork since before I was born. They just weren’t ones to make sauces or gravies when roasting pork. All I did was add some veggies and wine to make the sauce. The greater part of the recipe is all theirs and I’m just glad I know how to do it myself. I only hope I can convince one of our young family cooks to give it a try. They really have no idea what they’re missing. Wishing you and all whom you hold dear the Happiest of Holidays, too, Judy. When I saw the link to porchetta con finocchio, I was expecting fennel seeds rather than fennel fronds. Fennel seeds and pork are a well known combination — I love finocchiona (salami with fennel seeds). I’ll have to try this 🙂 Also love the story about using the baker’s oven. The pork roast looks great, it must have been delicious. Thank you, Stefan. That roast was a real treat for me. Zia couldn’t believe I was making one and I only wish she’d been here to share it. It’s funny that my family never cooked with fennel, only the fronds. It really does give a great flavor to porchetta. Terrific recipe! Fennel has such great taste and isn’t used nearly enough (in fact I plan to work with it in several recipes soon). I’ve not heard of Porchetta con Finocchio before – what a brilliant idea. This is inspired. And the roast is gorgeous! Thanks for the compliment, John. Funny thing that my family never cooked fennel and only used the fronds as an herb for seasoning. I tell you, though, this is the way to go. The fronds really do season the meat well. And there’s still plenty of finocchio to enjoy raw. In fact, it wouldn’t be the holidays without some. I had fresh fennel and rosemary and was looking for a good porchetta recipe. I found your recipe and decided to try it. I made it last night and it was absolutely fabulous! I used pork sirloin roast instead of the pork shoulder and it worked well. Thank you so much for posting! I look forward to trying more of your recipes! I am so glad that you found, prepared, and enjoyed my family’s recipe for porchetta. This is truly one of my family’s classics, served on holidays and special occasions, and it’s good to hear that others are enjoying it as much as we all do. I cannot wait to tell my Aunt, mia Zia, that someone made our porchetta and wrote to tell me. From both of us, thank you for taking the time to do so.